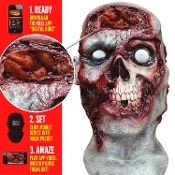 DIGITAL DUDZ PULSING ZOMBIE BRAINS MASK. Digital Animation Zombie Human Skull Latex Mask Uses Smart Phone Technology To Come Alive! After downloading a free Digital Dudz App (unique to your mask) on your smart phone. Slide it into position in this full over the head latex mask, launch the animation and bring your mask to life. Mask pocket can accommodate a mobile device up to 6-inch x 3.25-inch (pretty much everything, including the Galaxy Note II) Apple devices must be running iOS 5 or greater. Android must be running Android 2.2 or greater.